Donations are the lifeblood of EAF. We partner with local businesses, colleges, universities, large corporations, and many more in order to obtain technology for the charities we support. 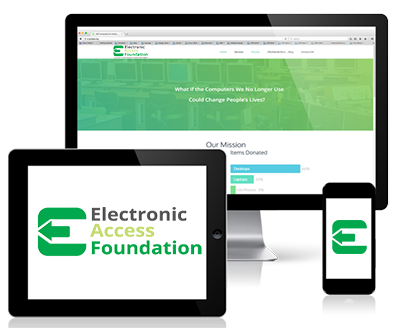 If you or your organization have any unused IT assets call Electronic Access Foundation. At EAF we can provide the full IT asset management services your organization expects while saving 1000’s in costs. In the event your organization already has these services in place you may contact us to reduce the amount of e-waste as many of the items discarded by large entities still have many years of use in the consumer markets. EAF is the right option for the community, the environment and the future. When you donate your items to EAF, we will schedule a time to pick up your electronics and find a proper home for them. We will properly sanitize your data and make sure all the data is securely erased. When you donate to EAF you are keeping one less computer or cell phone from being thrown in a landfill. EAF works to remanufacture all items that it receives to guarantee a new home for someone in need. Please fill out the form below to allow us to schedule a date to pick up your viable electronics. Electronic Access during the winter months schedules pickups 2-3 times per month with 5-6 possible monthly pickup dates during the spring, summer and fall. As a 100% volunteer organization, we make every effort to reply to you within 2 business days. Electronic Access Foundation is able to pickup donations of multiple tablets, laptops, desktops and flat screen monitors in the New Jersey / New York area. Electronic Access Foundation has partners in other areas of the United States that we may be able to refer you to if you are outside our area. We unfortunately are not able to coordinate pickup of smaller donations from individuals at this time. **Please note** – EAF can not pickup CRTs, tube televisions and large commercial printers. Are a Majority of Your Donations Over 5 Years Old? If you're donating more than 25 items, we'd like to get a feel for what you've got to make the necessary accommodations. You're welcome to either type out the items you have, upload a .csv file or upload images for us to take a look at. Please type out the list of donations you have for us. Please one line-item per line. Please upload images of the items you're planning on donating, up to 5 images not exceeding 10MB.